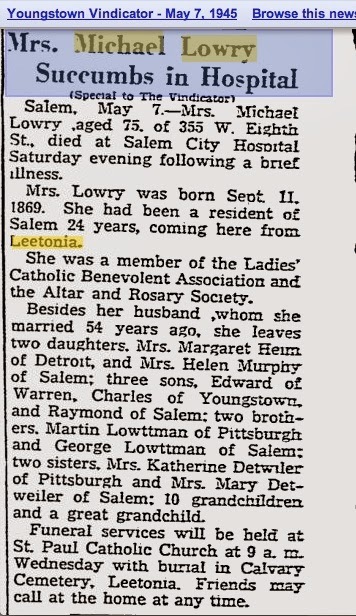 The Vindicator published this obituary of my great great grandmother Anna Lottman Lowry on May 7, 1945, two days after her death at Salem Hospital. Born in Germany, she married Michael around 1890. Interestingly, in my massive collection of Lowry family photos, I have not one of Anna (at least that I can identify) and only one of Michael. Since they had five children who survived at least into the 1970’s, I’m hoping that someone out there has additional photos of them. ← Peace Be With You!